The inevitable catastrophe has happened. You saw it coming and prepared. Ready with your survival tools, you moved to a secure location with everything you needed. You live happily ever after and raise your family and never see another living soul again. Or, you live in fear for the remainder of your life, always looking over your shoulder, waiting and wondering when the first and last looters will come and take away all you’ve so carefully put together. Is there a better way? We all desire to live, survive, and thrive. When the “end of the world” situation happens, that one person or family in any given area of the world, who has spent their lives working so hard on the perfect, ideal self-sufficient setup, also becomes the ideal target. They will have lost access to medication. And they will have no hope. Where fear begins, chaos reigns. Is there a better way? 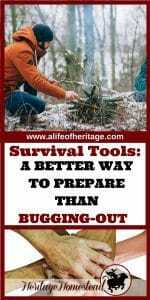 What can we do in addition to always preparing for a crisis and wondering if we have all of the tools for survival in place? The answer is complex and will take time and effort. Which, understandably, are hard to come by when families, children, animals, gardens and land need tending. One of the best and hardest solutions is this: we must implore, convince, teach, inspire…whichever method works best…those in our very neighborhoods to take action to become more self-sufficient. And after our neighbors have been inspired, we must extend this desire to our communities and towns, and then to our states, to live a more self-sufficient lifestyle. But first, let’s look at why it is such an important tool of survival to have large communities of people living self-sufficient lifestyles before we explore how to do this. • You become a target. As mentioned above, if you’re prepared for a crisis but everyone around you is not, you become the target. 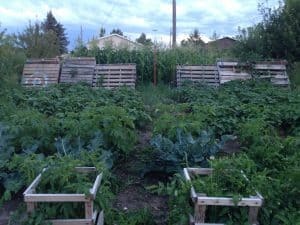 If more and more people begin growing and producing food in every corner of their house and yard, the less likely they are to head to your place when things get rough. • Our nation needs this change. Changing how people live may save your goose…but the other benefit is that the health of our nation needs this! As a whole, we have become a consumer nation, driven by our wants rather than our needs and because of this we have lost our health. Many Americans have forgotten that our health is directly linked to what we eat and also to the environment we are surrounded by every day. And if we don’t have our health? I’m not sure we have much of anything. • Healthier people are also happier people. When people have food they are happy, right? But when they have healthy food that makes them healthier, it will make them even happier…well, we are on to something then! • People who are more self-sufficient have grit when life crumbles. This grit is an important factor in life. I know I would be much more comfortable in a world that doesn’t fall apart or turn against each other at the drop of a hat. • A nation divided cannot stand. If a national crisis were to occur and we all turned against each other, the situation would go from bleak to entirely hopeless really quick. But if communities of people worked and banded together, all would not be lost. • Those who already know how to barter will turn to that instead of looting and stealing. We all must gain skills that are valuable in order to trade those skills. A large variety of skills is important so we each have something to contribute and no one lacks anything. Not only will this save us money but if the banking system were ever to completely collapse, a necessary and very helpful system would already be in place to handle the needs of life. All of these “why’s” should spur us into action. • When your area and personal provisions have run out of essential supplies. In reality, without a foolproof plan and an army of people, bugging out can be dangerous. 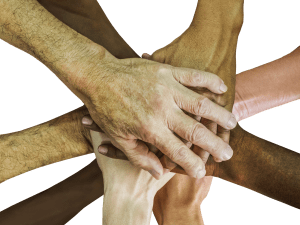 This is a subject all on its own and could stir up a lot of opinions but for the sake of this article, let’s look at how we can begin to transform our neighborhoods into thriving self-sustaining communities. • First, if not already, live self-sufficiently now. • This can be the first building block of community in your area. • If there aren’t any groups already established, seek out like-minded people and begin one! • Have experts speak on various subjects relating to living a more self-sufficient lifestyle. • Invite your friends, family, and neighbors to the meetings! • Invite them over for dinner of all you can eat homegrown goodness. How could that NOT convince them? Homegrown food has an incredible, over-the-top taste. It’s amazing compared to store bought, mass produced food. • Share any soap, honey, candles, and lotions you make. This will pike curiosity and may result in another avid maker of homemade goodness. • Does your neighbor do any wood working or service that you could use? It never hurts to ask if you can trade for any work needed. Because here’s the deal, there are a lot of selling points to living a self-sufficient life. It is empowering to know your family will have sufficient food and supplies in an emergency no matter the size of income or if the grocery stores are open. It is empowering to grow and provide food for your family. And when you make your own food, you know EXACTLY what’s in it and won’t worry about MSG, dyes, and GMOs…you know your food is healthy and wholesome. And everyone needs to get in on this! Although this is a long term vision, in the end, it is the best solution. Working together as neighborhoods and communities will keep our families safer than bugging out and potentially being caught in dangerous, unknown situations. This is also a really good plan for our nation as well. We’ve lost so much in our quest for fast and easy food, success, and fortune. It’s time we regroup and remember what is truly important. We are a nation founded on God. Being able to live a healthy, well-meaning life that can stand the test of any crisis gives individuals and our nation a great and deep strength. But even if we survive “the crisis”, it is much more important to know where our saving grace really comes from. Who are you founded on? This is a long-term vision that requires a lot of patience and diligent effort. 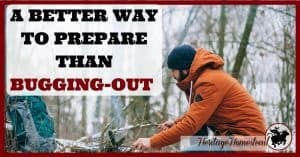 But it is a better way to prepare than bugging out when SHTF. It is a tool in our survival belt that is often overlooked. This leaves me with a lot to think about. My introverted nature balks at the idea. Most times, however, this is just what we need to grow the most: a task that stretches us beyond our resources and personalities. What do you think? Will you be bugging out?